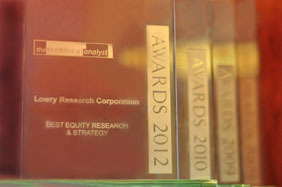 Lowry has been honored with many industry awards, highlighting Lowry's committment to Research Excellence. "...an extraordinarily good record...ranks among those that have done what so few are supposed to be able to do: beat the market. ...It probably has the largest following of any technical service among the large institutions." "In a far corner of the chartroom, we have the Lowry wall... I have subscribed to the Lowry service for decades, and find the service extremely helpful as it more empirically quantifies the daily forces of Supply and Demand based on their calculations of Selling Pressure (SP) and Buying Power (BP). Obviously, rising Demand and declining Supply are what Bull Markets are all about." "...the record of Lowry's technical signals was unusually good." "The results of this study show that the Lowry method of technical analysis ...has led to returns significantly in excess of those achieved by naive buy and hold programs." "Founded in 1938, this is the Rolls Royce of timing services, with a high rating among financial institutions and market strategists... Wharton School of Business and Finance measured the results from 1950 to 1975 of the timing recommendations by the Lowry Research Advisory Services. An investor would have done 2 1/2 times as well by following Lowry's signals as he would have by pursuing a buy-and-hold strategy." "Lowry's ...has produced an extraordinarily good record over the past 40 years, far in excess of what the theoreticians had heretofore considered possible." "...a technical approach to market analysis that is straightforward and uncomplicated. Its buying and selling recommendations ...which have been a matter of public record since 1938, are extremely well documented and easy to employ." "Lowry Research ...the grand daddy of market timing firms." Bottoms and New Bull Markets"